Week 6, June 19 2016 ~ !IT'S SUMMER! We did our weekly farm walk last night where we go around and look at everything. 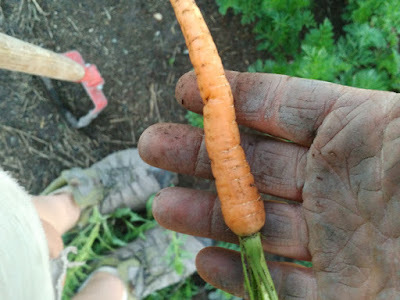 Pull a couple carrots out of each row, a few beets, notice how the broccoli and cabbage are starting to head up. See how it !actually! didn't kill the corn to flame weed it when it was an inch high last week (thank you internet articles for being right about that…). Looking for bug problems and signs of good bugs, making a long, but manageable, list for the week ahead. The Zucchini and Summer Squash are just about to flower. 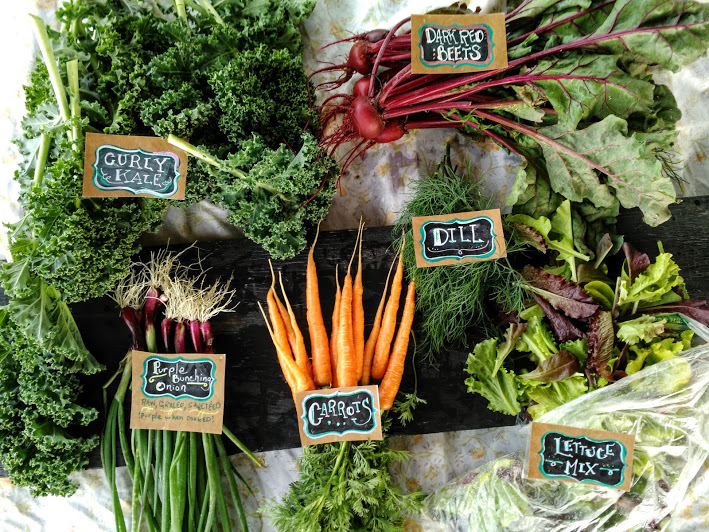 This time of year feels a little like the calm before the great deluge of summer vegetables that are to come. This is also the time of year where we really have to stay on top of the weeds. This year, our goal is to not let any weeds go to seed in the two acres around our house where the vegetable beds are. Last week I kind of altered that goal to - no noxious weeds going to seed in that two acres - and no weeds going to seed at all….next year. Our apologies that last week the Thursday CSA folks didn't get garlic scapes in their shares. Last year we only had 25 CSA members and 100 row feet of garlic. This was enough scapes for everyone. So with some easy math I thought 200 row feet of garlic is enough to do the same for our 50 families this year….but somehow that 1+1=2 didn't really work out. I am scouting for scapes every other day and hopefully will have enough for the shares this week. If not, there is a later variety of garlic that puts out scapes last, and we will save those for you guys. In past years, we literally harvested, made sure there was enough, and then wrote the newsletter on CSA day. This year, to preserve our sanity, we're making the newsletter a few days before the reality of harvest. We're learning that, for a variety of reasons, there will be weeks where Tuesday folks may get different things than the Thursday folks. When this happens, we will ALWAYS put an explanatory note in the box with the shares. We thank you for your patience on this. This week all the veggies are pretty straightforward; nothing too unusual in the box this week. But one way you can really maximize your share is by using the tops from your veggies. Beet greens are actually one of my favorite greens to eat and you can also eat your carrot tops! Remember! If you aren't going to eat the greens right away to cut them off the roots. Both the roots and the greens will stay fresh longer this way; the tops pull moisture out of the roots even after they are harvested. And always keep greens in plastic in the fridge to keep them fresh if you aren't eating them right away. Use those carrot tops! Substitute carrot tops for basil in your favorite recipe and...no it won't taste like basil pesto at all. It'll be more like a parsley pesto but still really really yummy! Not feeling like pesto? Use your carrot tops in salad dressing or, if you juice, yes, you can juice them. Sauteed Beet Greens Beet greens are one of my Very Favorite greens to eat. Here is how I prepare them. Saute onion or garlic in a generous amount of fat. Very finely chop beet greens discarding the woody part of the stems. When onions/garlic are translucent toss in your finely chopped greens, cook 2-3 minutes, add a bit of balsamic vinegar or lemon. Cook another minute or two and !boom! A pan full of yummy veggies. Your Curly Kale, or any other bitter greens, will be lovely lightly sauteed this way. I love roasted beets and like to roast a bunch all at once to have in the fridge to go with lunch all week. I like them served warm or cold. When it's hot out I love cold beets with yogurt dill sauce; YUM! I hope you are enjoying getting chard or kale every week and aren't getting tired of Kale. Remember you can use cooked kale or chard in place of cooked spinach in any recipe.